Evolve – Be the Savior as Part of a Team or the Monster of Destruction! ‘Evolve’ is an upcoming video game that has been announced to be released in this following year of 2015 in the month of February. It is to be an online multiplayer, role playing, shooting game, where players can choose to be a part of a team to save humanity from monstrous wildlife in a hostile planet, or else be a single player that plays the evolving monster in this world and attempt to destroy the team of “saviors”. 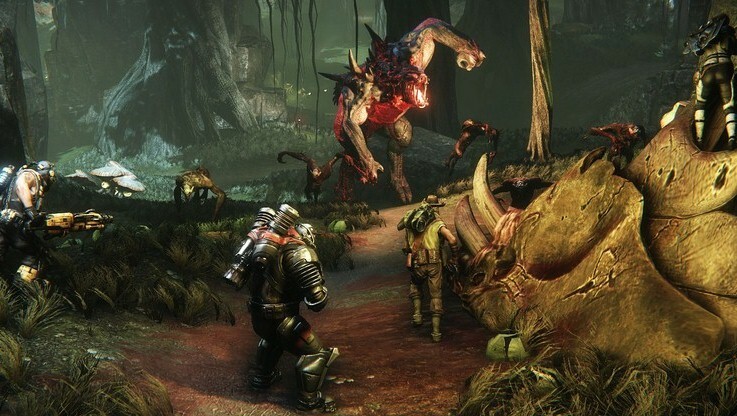 Evolve is a first person shooter game that solidly falls into the “action” genre of video games. This game’s main theme is four versus one matches (that are an enjoyably themed to be vicious and brutal). Man-eating plants, Goliaths, Wraiths, Behemoths, and Krakens are but a sample of the interesting monsters that this particular game world throws the player’s way. And man of them aren’t just creatures that you can simply shoot and kill with one shot. Rather, gamers will have to deal with predatory wildlife and player-controlled monsters which will take an entire team of four with plenty of strategy and planning to kill. There are two basic teams of adversaries within this game. One is the team of four who are working to save the humans of this hostile world from blood-thirsty wildlife and a vicious monster. (They are also trying to get them off this hostile planet it seems.) The second team – or adversary – is the vicious monster in question. So in essence, there will be five player characters available in this video game – that is, the four hunters, and the one monster. However, note that this particular monster is different from the random predatory wildlife in this world in that is is a much smarter creature, much more powerful, and is capable of evolving into various higher forms on eating some of the lower wildlife forms of monsters in this world. This super-powered, intelligent monster will of course have weaknesses of its own. And it will need to even avoid the team of four (or four “hunters”) in the game at times until it is able to gobble up enough wildlife to evolve into a newer and better version of itself. So really, a gamer’s role in this game world all depends on whether he or she would like to be the all-powerful monster playing alone to destroy the team of four, or whether he or she would like to play as a part of a team of four in order to protect the defenseless humans around them and fight the wildlife monsters as well as the player-controlled monsters in the game. If the gamer prefers a team sport however, he or she can choose to be a “hunter”. A hunter’s main job will be to fight the monsters and protect the humans of this world. Hunters work in a team of four in this world, and team work and strategic planning between these four is essential if one wants to survive against their monstrous adversaries. There are four types of “hunters” in this game that a player can choose to control. They are the “Assault”, the “Trapper, the “Medic”, and the “Support. The “Assault” is a hunter that specializes in attacks. Any monster that finds itself on the wrong end of the Assault hunter’s gun will quite possible wind up dead. The Trapper hunter is the tracker of the team. It is this member who is able to track down a monster (or the monster) and trap it as well. The Medic hunter is the member that keeps the others alive. However, that does not mean that they can’t inflict sufficient damage on the monsters either! The Support hunter is the more versatile member of the group and allows the team to hit harder and to better escape the dangers they find themselves in. All in all, it looks like you’ll have fun cracking down in this game no matter what player character you choose!